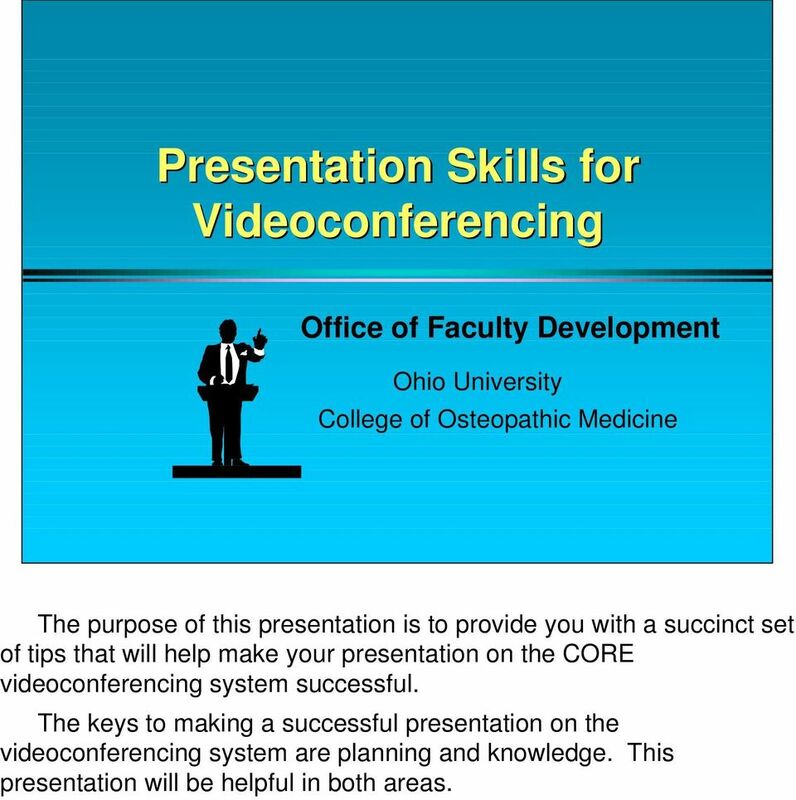 Download "Presentation Skills for Videoconferencing"
1 Presentation Skills for Videoconferencing Office of Faculty Development Ohio University College of Osteopathic Medicine The purpose of this presentation is to provide you with a succinct set of tips that will help make your presentation on the CORE videoconferencing system successful. The keys to making a successful presentation on the videoconferencing system are planning and knowledge. This presentation will be helpful in both areas. 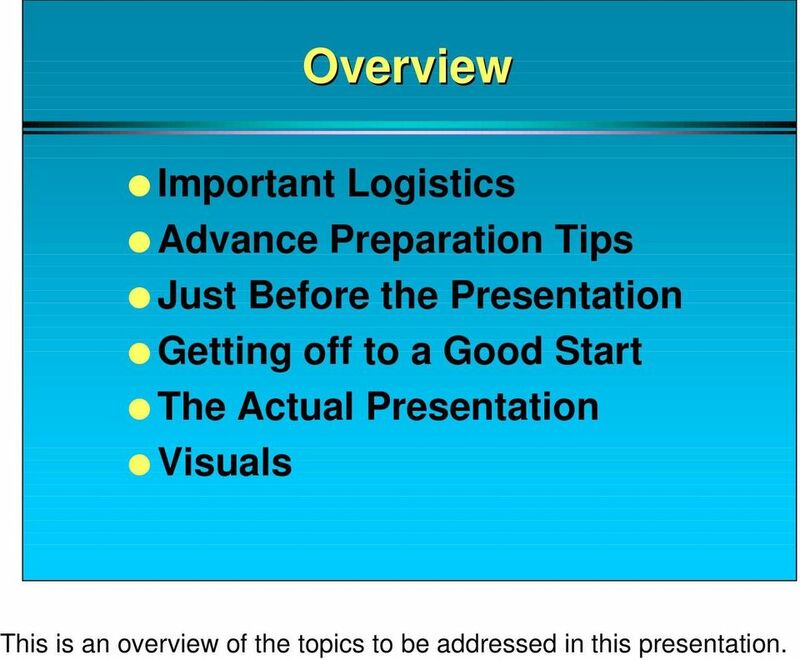 2 Overview Important Logistics Advance Preparation Tips Just Before the Presentation Getting off to a Good Start The Actual Presentation Visuals This is an overview of the topics to be addressed in this presentation. 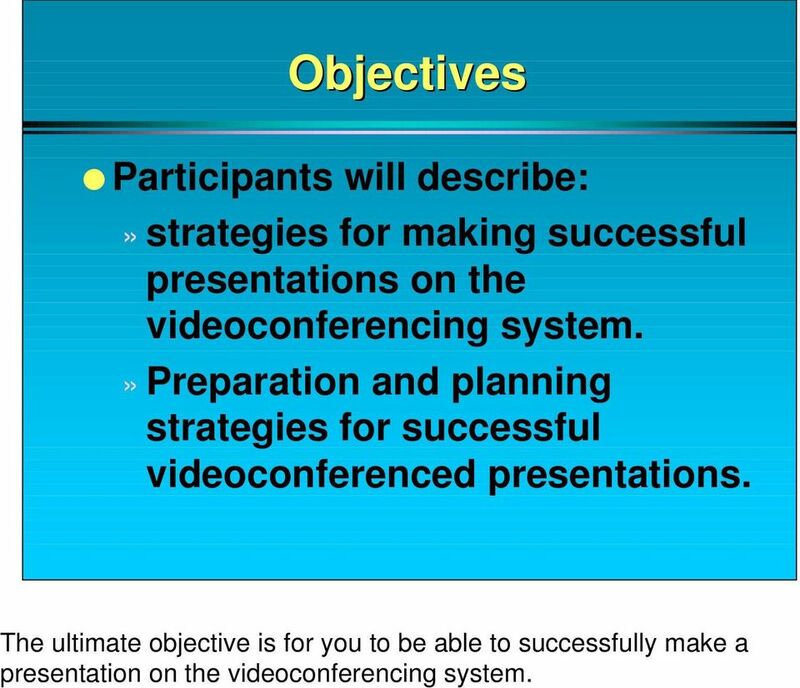 3 Objectives Participants will describe:» strategies for making successful presentations on the videoconferencing system.» Preparation and planning strategies for successful videoconferenced presentations. The ultimate objective is for you to be able to successfully make a presentation on the videoconferencing system. 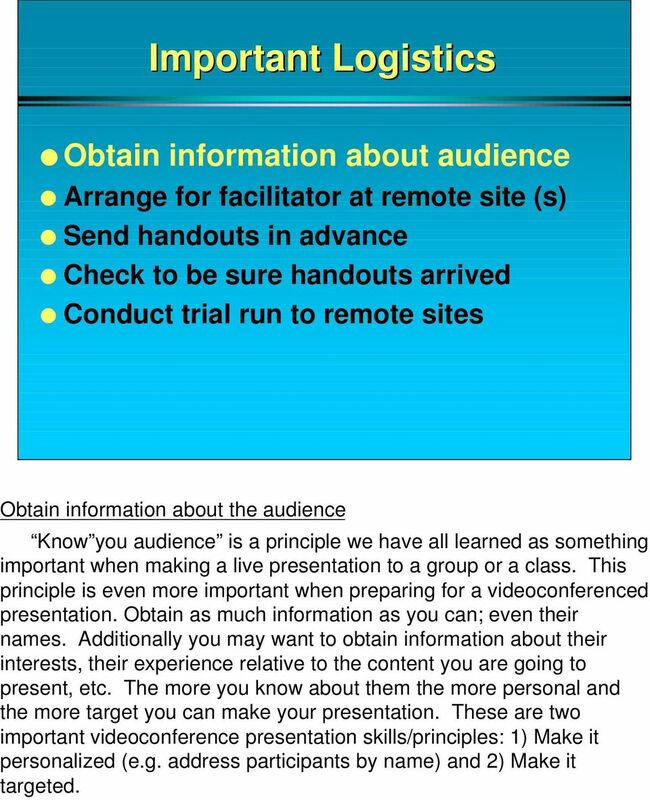 4 Important Logistics Obtain information about audience Arrange for facilitator at remote site (s) Send handouts in advance Check to be sure handouts arrived Conduct trial run to remote sites Obtain information about the audience Know you audience is a principle we have all learned as something important when making a live presentation to a group or a class. This principle is even more important when preparing for a videoconferenced presentation. Obtain as much information as you can; even their names. Additionally you may want to obtain information about their interests, their experience relative to the content you are going to present, etc. The more you know about them the more personal and the more target you can make your presentation. 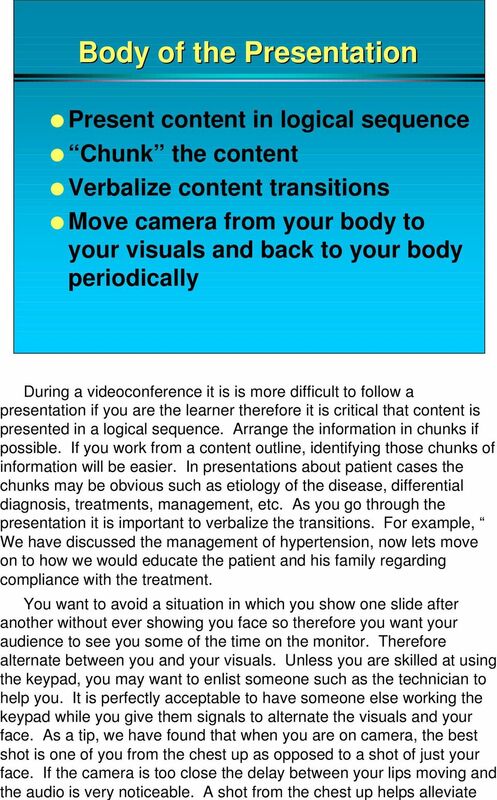 These are two important videoconference presentation skills/principles: 1) Make it personalized (e.g. address participants by name) and 2) Make it targeted. 5 Important Logistics Obtain information about the audience Arrange for facilitator at remote sites Send handouts in advance Check to be sure handouts arrived Conduct trial run to remote sites Arrange for a facilitator at the remote site (s). Here are several things a facilitator/coordinator at a remote site might do. 1. Take roll or record who is present for documentation purposes. 2. Control the keypad functions such as keeping the mute button on until someone is ready to speak. 3. Encourage participants to ask or answer questions. 4. Repeat participant questions. 5. Let the originating site know if there are any kind of problems. 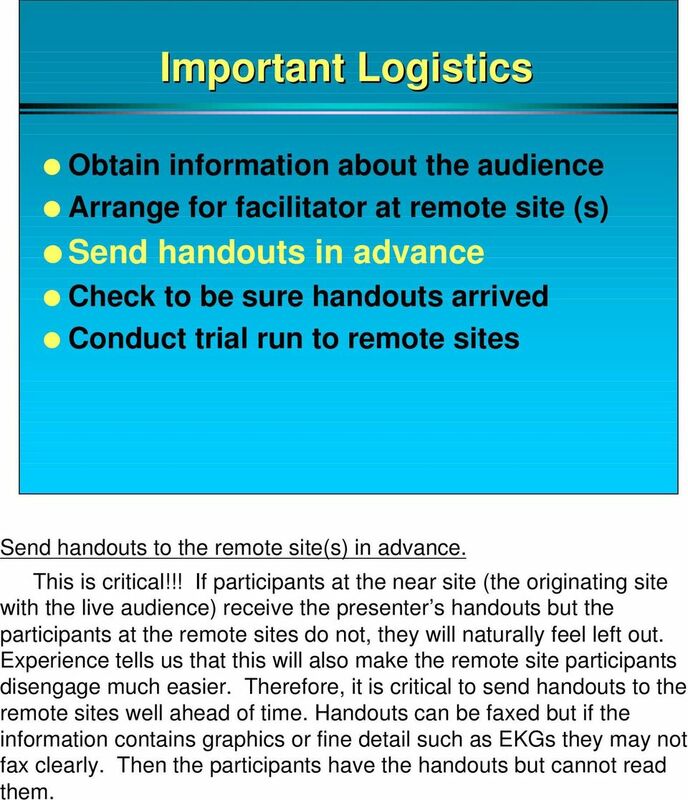 6 Important Logistics Obtain information about the audience Arrange for facilitator at remote site (s) Send handouts in advance Check to be sure handouts arrived Conduct trial run to remote sites Send handouts to the remote site(s) in advance. This is critical!!! 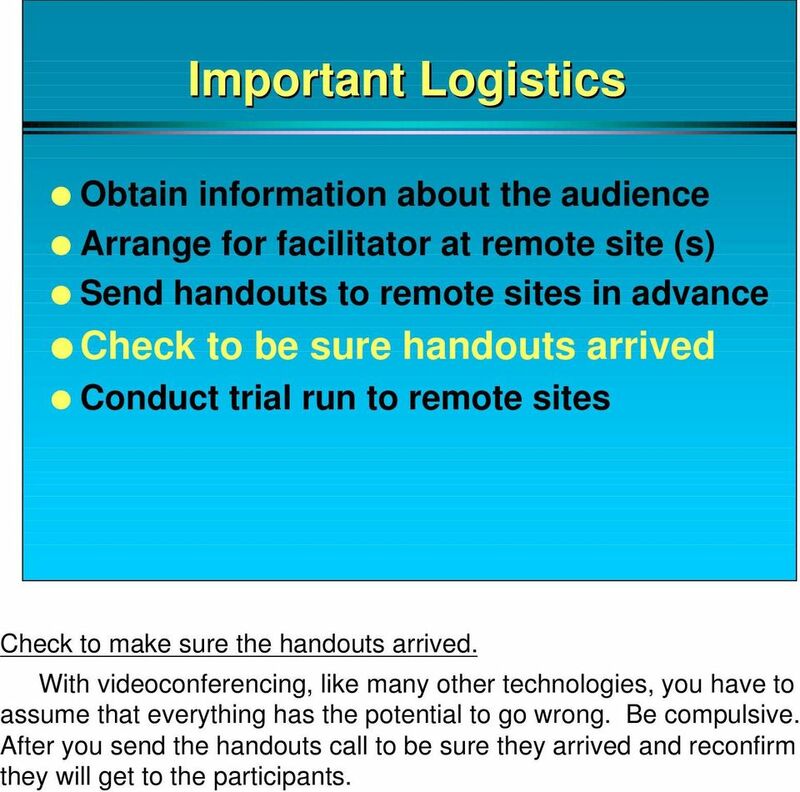 If participants at the near site (the originating site with the live audience) receive the presenter s handouts but the participants at the remote sites do not, they will naturally feel left out. Experience tells us that this will also make the remote site participants disengage much easier. Therefore, it is critical to send handouts to the remote sites well ahead of time. Handouts can be faxed but if the information contains graphics or fine detail such as EKGs they may not fax clearly. Then the participants have the handouts but cannot read them. 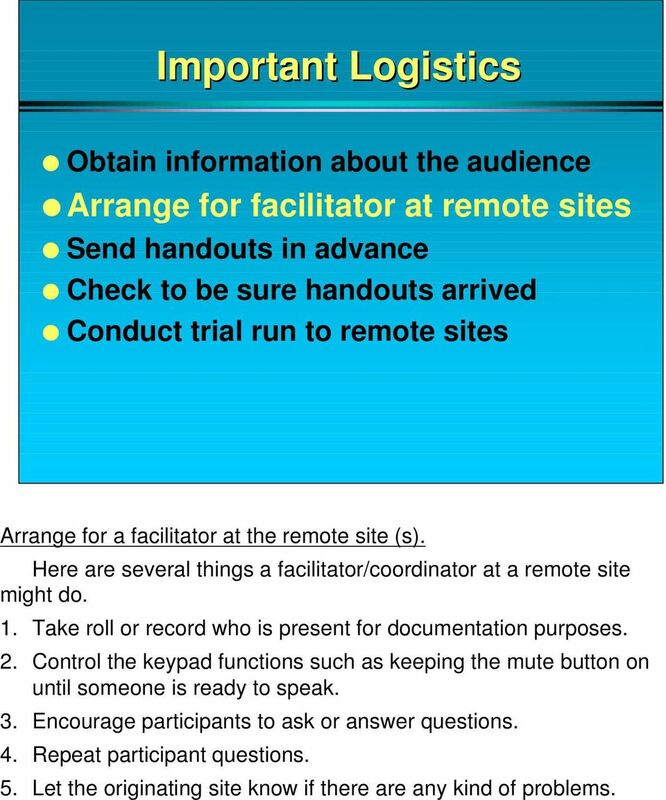 7 Important Logistics Obtain information about the audience Arrange for facilitator at remote site (s) Send handouts to remote sites in advance Check to be sure handouts arrived Conduct trial run to remote sites Check to make sure the handouts arrived. With videoconferencing, like many other technologies, you have to assume that everything has the potential to go wrong. Be compulsive. After you send the handouts call to be sure they arrived and reconfirm they will get to the participants. 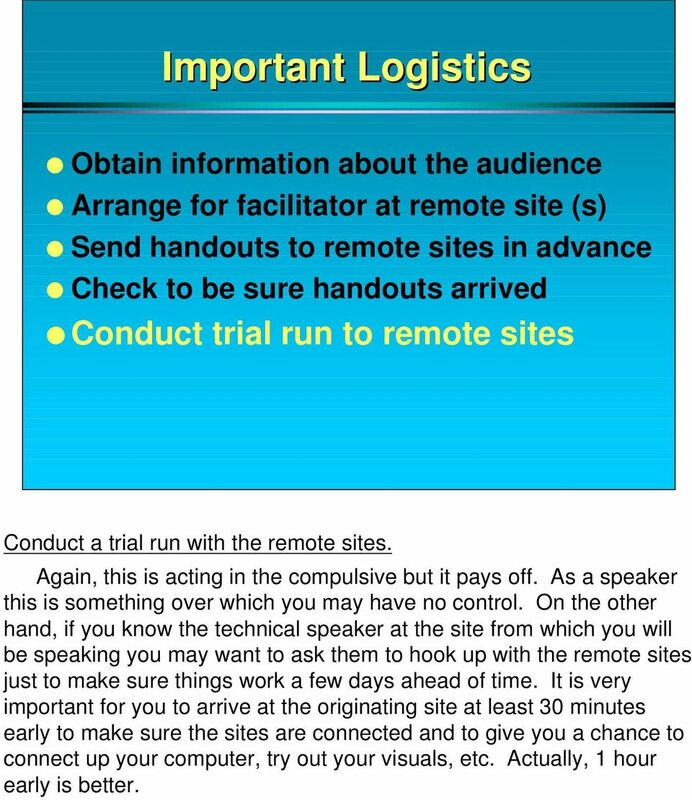 8 Important Logistics Obtain information about the audience Arrange for facilitator at remote site (s) Send handouts to remote sites in advance Check to be sure handouts arrived Conduct trial run to remote sites Conduct a trial run with the remote sites. Again, this is acting in the compulsive but it pays off. As a speaker this is something over which you may have no control. On the other hand, if you know the technical speaker at the site from which you will be speaking you may want to ask them to hook up with the remote sites just to make sure things work a few days ahead of time. It is very important for you to arrive at the originating site at least 30 minutes early to make sure the sites are connected and to give you a chance to connect up your computer, try out your visuals, etc. Actually, 1 hour early is better. 9 Preparation for the Presentation Plan to present less Base presentation on realistic learning objectives Plan for interaction (e.g. questions) Test visuals well in advance With videoconferencing you cannot present as much content in same amount of time as you would in a normal presentation because you need to take time to interact with the audience more, you need to repeat the information more and you generally need to structure more (e.g. periodically summarize.) Since you need to present less content you will probably want to reduce the number of learning objectives which you expect the learners to accomplish. You must plan for interaction. For example, have some specific questions you plan to ask of the participants and remember to plan to spread the questions around to the various remote sites so that everyone feels involved. Testing your visuals in advance is one of the most important planning steps you can take. If the visuals can t be seen clearly by the participants they will be frustrated and they will disengage. If you use PowerPoint, it is important to realize that what looks good on your screen or what looks good projected onto a pull down screen may look terrible on a TV monitor. Later in this slide program you will get some tips on visuals and we ask that you please follow them. You can work with your technician or a faculty development person to test your visuals in advance. 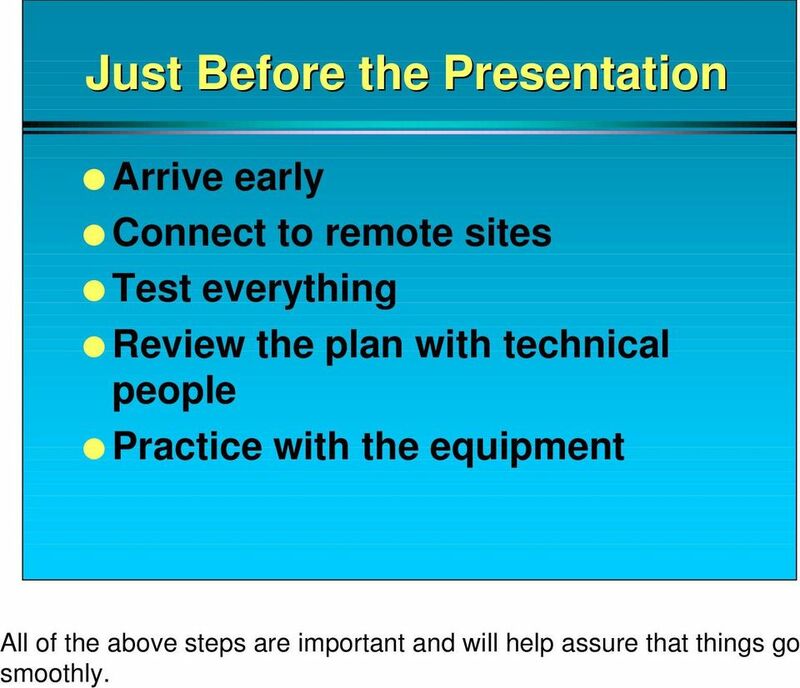 10 Just Before the Presentation Arrive early Connect to remote sites Test everything Review the plan with technical people Practice with the equipment All of the above steps are important and will help assure that things go smoothly. 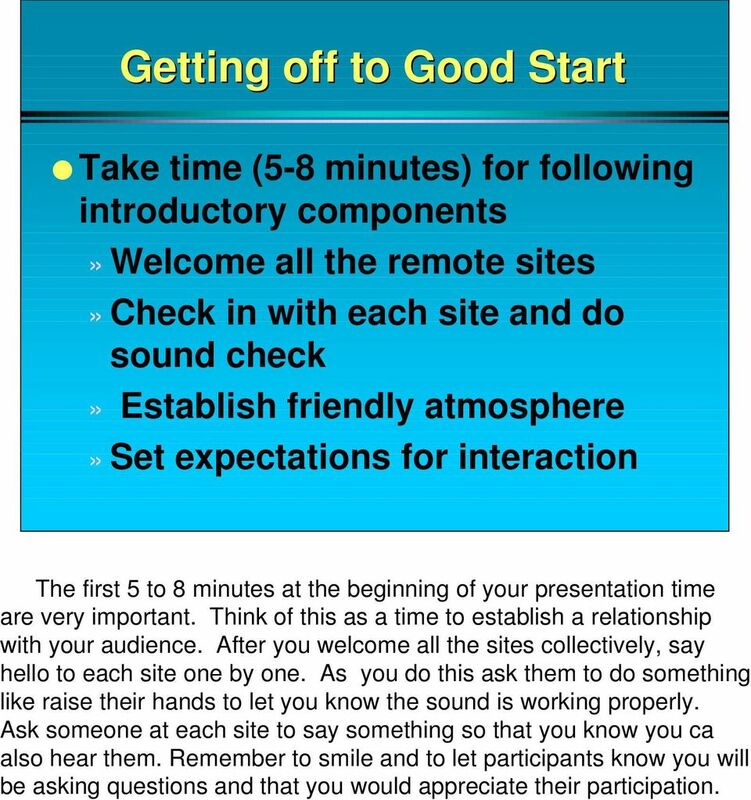 11 Getting off to Good Start Take time (5-8 minutes) for following introductory components» Welcome all the remote sites» Check in with each site and do sound check» Establish friendly atmosphere» Set expectations for interaction The first 5 to 8 minutes at the beginning of your presentation time are very important. Think of this as a time to establish a relationship with your audience. After you welcome all the sites collectively, say hello to each site one by one. As you do this ask them to do something like raise their hands to let you know the sound is working properly. Ask someone at each site to say something so that you know you ca also hear them. Remember to smile and to let participants know you will be asking questions and that you would appreciate their participation. 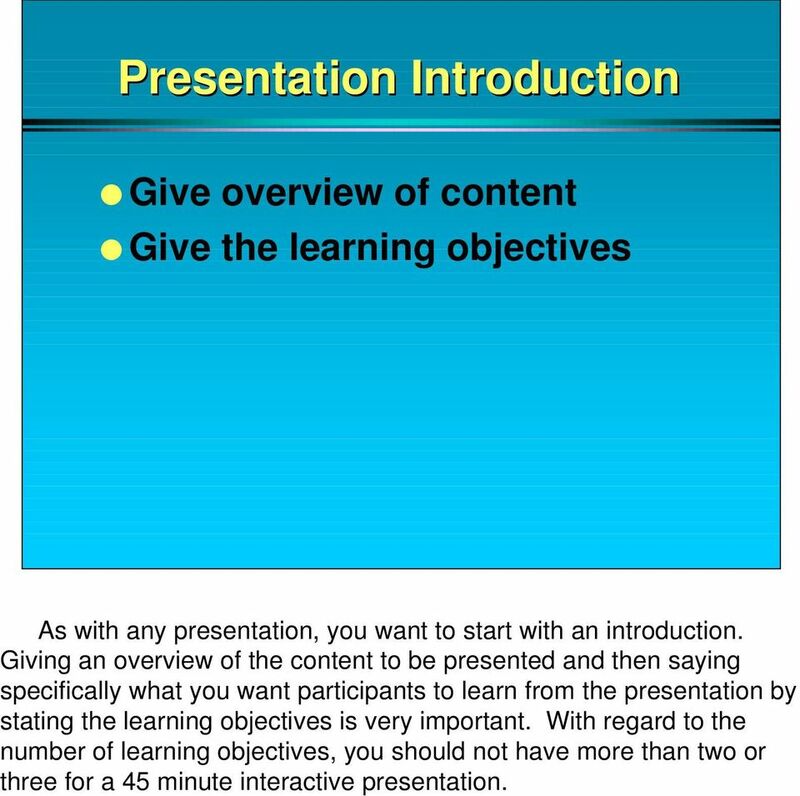 12 Presentation Introduction Give overview of content Give the learning objectives As with any presentation, you want to start with an introduction. Giving an overview of the content to be presented and then saying specifically what you want participants to learn from the presentation by stating the learning objectives is very important. With regard to the number of learning objectives, you should not have more than two or three for a 45 minute interactive presentation. 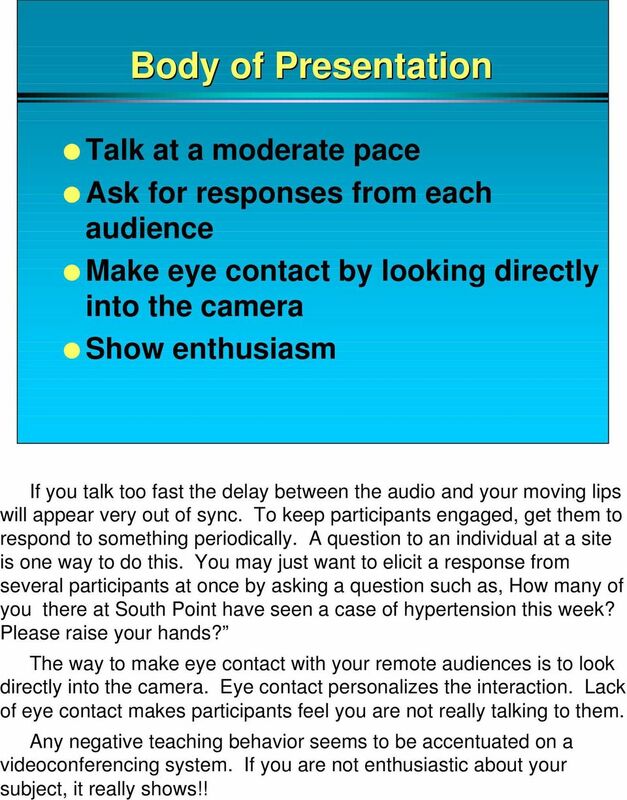 14 Body of Presentation Talk at a moderate pace Ask for responses from each audience Make eye contact by looking directly into the camera Show enthusiasm If you talk too fast the delay between the audio and your moving lips will appear very out of sync. To keep participants engaged, get them to respond to something periodically. A question to an individual at a site is one way to do this. You may just want to elicit a response from several participants at once by asking a question such as, How many of you there at South Point have seen a case of hypertension this week? Please raise your hands? The way to make eye contact with your remote audiences is to look directly into the camera. Eye contact personalizes the interaction. Lack of eye contact makes participants feel you are not really talking to them. Any negative teaching behavior seems to be accentuated on a videoconferencing system. If you are not enthusiastic about your subject, it really shows!! 15 Presentation Summary Three Summarizing Techniques» Review main points.» Ask one person in each audience to state something important he/she learned.» Give posttest. Providing a summary is an important part of structuring your presentation. Two summarizing techniques are suggested. As part of your summary please consider restating the learning objectives to help participants focus on what you wanted them to learn from the presentation. This can be worked in as part of your summary. 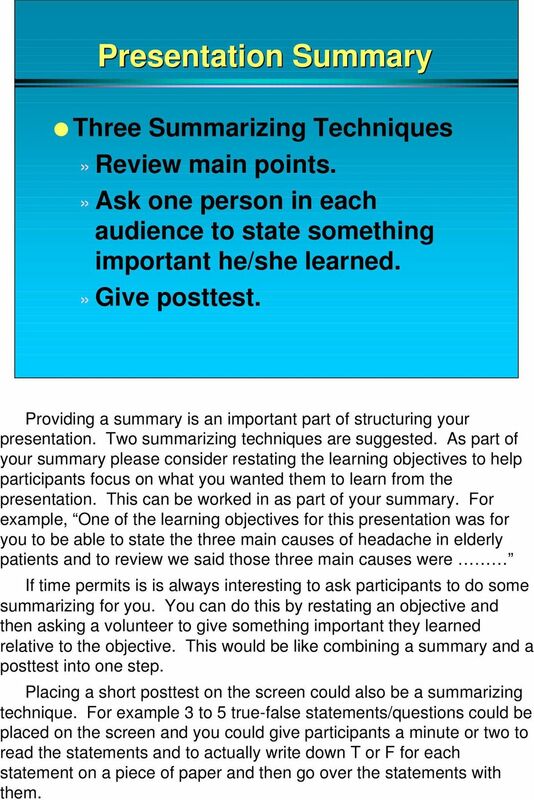 For example, One of the learning objectives for this presentation was for you to be able to state the three main causes of headache in elderly patients and to review we said those three main causes were If time permits is is always interesting to ask participants to do some summarizing for you. You can do this by restating an objective and then asking a volunteer to give something important they learned relative to the objective. This would be like combining a summary and a posttest into one step. Placing a short posttest on the screen could also be a summarizing technique. For example 3 to 5 true-false statements/questions could be placed on the screen and you could give participants a minute or two to read the statements and to actually write down T or F for each statement on a piece of paper and then go over the statements with them. 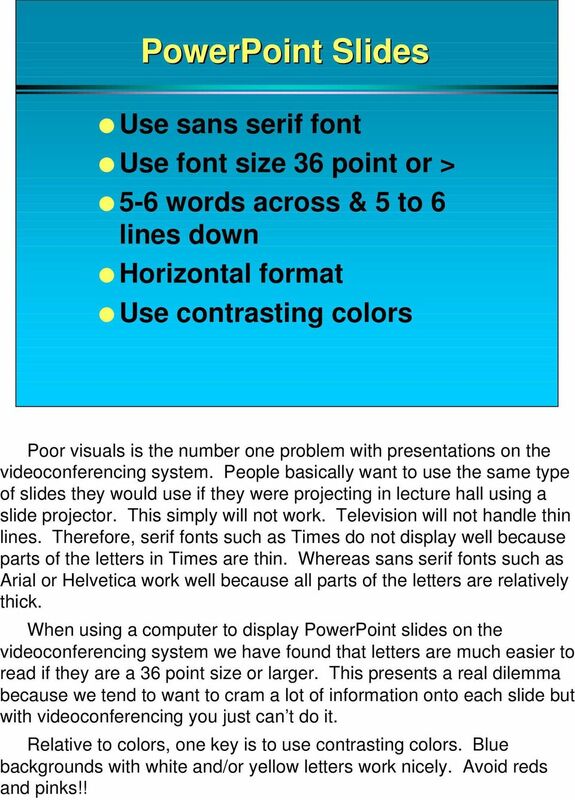 16 PowerPoint Slides Use sans serif font Use font size 36 point or > 5-6 words across & 5 to 6 lines down Horizontal format Use contrasting colors Poor visuals is the number one problem with presentations on the videoconferencing system. People basically want to use the same type of slides they would use if they were projecting in lecture hall using a slide projector. This simply will not work. Television will not handle thin lines. Therefore, serif fonts such as Times do not display well because parts of the letters in Times are thin. Whereas sans serif fonts such as Arial or Helvetica work well because all parts of the letters are relatively thick. When using a computer to display PowerPoint slides on the videoconferencing system we have found that letters are much easier to read if they are a 36 point size or larger. This presents a real dilemma because we tend to want to cram a lot of information onto each slide but with videoconferencing you just can t do it. Relative to colors, one key is to use contrasting colors. Blue backgrounds with white and/or yellow letters work nicely. Avoid reds and pinks!! 17 Using Overheads Rules on previous slide apply but 32 point may work. Overheads should be horizontal. Transparency film not needed. Lay all visuals on stage and peel off one at a time. A size 36 point font is still recommended for overheads. The clear transparencies are not needed. Instead you can just print them on plain paper. 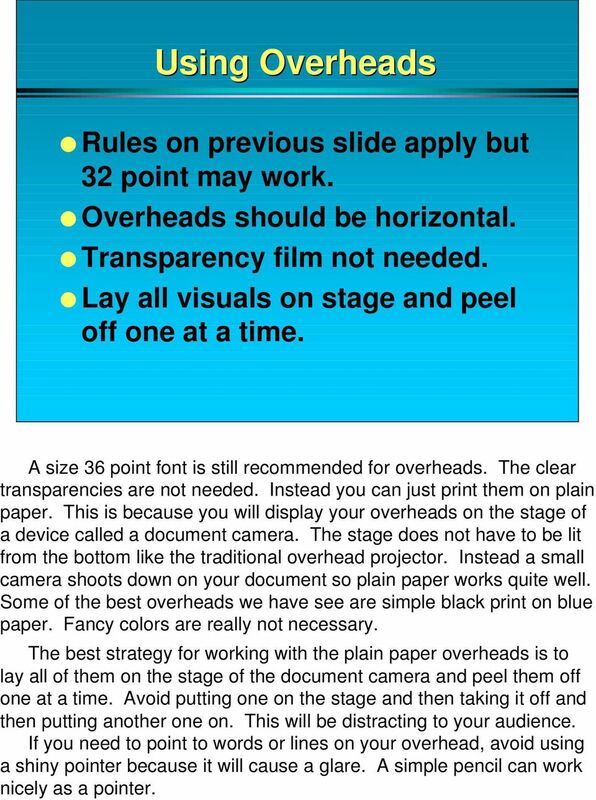 This is because you will display your overheads on the stage of a device called a document camera. The stage does not have to be lit from the bottom like the traditional overhead projector. Instead a small camera shoots down on your document so plain paper works quite well. Some of the best overheads we have see are simple black print on blue paper. Fancy colors are really not necessary. The best strategy for working with the plain paper overheads is to lay all of them on the stage of the document camera and peel them off one at a time. Avoid putting one on the stage and then taking it off and then putting another one on. This will be distracting to your audience. If you need to point to words or lines on your overhead, avoid using a shiny pointer because it will cause a glare. A simple pencil can work nicely as a pointer. Videoconferencing Operation Troubleshooting Procedures Starting the Vtel Unit: 1. Power up the computer (If you have a Compaq unit, the power switch is located on the front in the middle of the computer. Using the Polycom Video Conferencing System Instructions for equipment operation, basic troubleshooting, and pedagogical best practices. FIRST NATIONAL BANK OF ARIZONA. ExhibitOne Upgrades Communication and Monitoring During a Renovation of High-Level Meeting and Network Rooms. Making it clear. Guidelines to producing printed material for people who are blind or partially sighted. Welcome to the Quick Start Guide for TrialPad 2.0, the leading trial presentation and legal file management app for the ipad! Want more background and training tips? MS PowerPoint 2003 Basics Email: training@health.ufl.edu Web site: http://training.health.ufl.edu Microsoft PowerPoint 2003 Basics 2.0 hours This workshop assumes no experience with Microsoft PowerPoint. TIPS TO GET YOU READY TO MEET!